The temperatures are warmer now than what the experts predicted. That is, some time ago, experts predicted that by 2009 global temperates would be X and we are now at X+y, where y is some positive number measured in degrees; Celsius or Fahrenheit. This rise in today’s temperatures is due to increases in greenhouse gas emissions. So, to review. Today is not only warmer than yesteryear, but it is warmer than experts said it would be. In other words, thermometers have higher readings than expert predictions said they would. Net/net: It’s hot! And, to boot, this added dagger; it’s because of higher greenhouse gas emissions. Read: CO2. Okay, so, higher CO2 levels in the atmosphere cause temperatures to rise, and those temperatures, predicted some time ago by experts, have risen higher than even those predictions. The chart above [from JS. H/T WUWT] shows that we have had CO2 levels a full order of magnitude higher than we are seeing now. Can you give reason why a slight rise in the levels of CO2 now are going to send SpaceShip Earth into a tail spin? This chart[from CS] actually lays out what the good doctor James Hansen reported to Congress in 1988. He said that, by 2008, we would be a full half degree C higher than 1988. In fact, we were .3C below that 1988 reading. Not only has there been NONE, as in ZERO, global warming trend in the last 8 years, some say that we are entering a period of cooling. So, trot out all the experts you want. Until you can demonstrate good science that shows a link between CO2 and crazy high temps along with a pretty decent ability to predict this in even the short term, you can forget about getting buy in from anybody that all of this global warming hype add up to more than a hill of beans. Or coal if ya want. Facts and truth never enter into the Liberal mind! Global Warming and, of course, you. Okay, okay. Ya got me, some where deep under the course outside veneer of this polished Republican conservative is a bleeding heart liberal. Maybe not bleeding, and the whole heart thing—-not so much. Liberal, not at all, but really, in sum, bleeding heart liberal. When it comes to our planet, our world, I am all for not shitting where you sleep. We should take every measure to not pollute, to pick up after ourselves. When we dump DDT into the ground and all of a sudden our birds of prey begin dying? We should stop dumping that poison into the system. I am all for that. Always have been. Even back in Minnesota when we cooked “stuff” for Rue on the banks of that little “Not so Big a Lake” I was sad that I couldn’t take my dog there for a swim. Too dirty and nasty from chemicals. And yeah, I also get that we only have so much oil. So much of this fossil fuel that we have been blessed with. And too that end, we should try and make sure that we are as efficient in it’s use as we can be. If we are able to stretch a gallon of gas from 20 miles to 40-60 maybe 80, we should. We have to. We are obligated to treat this resource as we would any resource. With respect and with the goal of conservation when ever we are able. None of that is inconsistent with what I have been saying. In fact, it is entirely consistent with my message. Because the thing that you liberals fail to understand is that oil is useless UNLESS WE BURN it. There is not inherent use for it otherwise. You don’t take your kids on a trip to the Grand Canyon Oil Fields or to Old Oil Spout Faithful. The opposite. Oil is a resource that is both ugly and far far away in the earth’s crust. So, the whole idea of pollution and of conservation is a separate conversation that the one of Global Warming. It is okay to think that we should take care of our planet, to take care of our oil and to think that the whole idea of Global Warming is a fairy tale. Now, to be sure, there is more. There is the fact that ice is not melting, or, if it was, isn’t anymore. There is evidence that the data has been tampered with; to the degree that the trends have been moved more than they rise. Additionally, there is parallel data that demonstrates that we aren’t warming. Some of this I have showed ya, some I have yet to gather. Much of it though, has been seen by more and more experts. And these experts are slowly quickly abandoning the cause. I promise to write more if you promise to get smarter. What if “What if” wasn’t? We must be losing this in translation. I am not so much making the case of whether the world is warming or not, I am more making the case that we don’t have to take some of the extreme measures that alarmists are suggesting. Are we warming? Perhaps, it sure seems that we are. Most, if not all, data suggests that in fact we are warming. However, it is going to be important that we understand the extent of that warming. The data I see you using is from the GISS? There are other temperature recording facilities and while they also show a warming trend, they are showing it much less. And we haven’t even begun the discussion of whether or not this is even due to man’ influence. We have not discussed the fact that the Greenhouse Gas we are emitting is CO2, which makes up X% of the total atmosphere, the normal cycles of the climate, the normal cycles of the sun or strange wacky things such as this one: Did you know, for instance, that some feel Mars is experiencing Global Warming as well? If that’s the case, then the extent of our CO2 emission is drastically understated indeed! The point is this, if humans are contributing to the warming of the planet, we need to identify how much. And then, then, we need to understand the impact to us as a result of that warming. And our response should be commensurate. If we are facing cataclysmic consequences, then hell yeah, let’s do something and fast. But if, as I suspect, the consequences are negligible or none, then our response should be in kind. What I want to avoid is a repeat of that most fantastic decision by our government to “Select the Winner” and subsidize ethanol. Not only is ethanol not viable, but by force feeding it down our throats, the worlds food costs have risen and people the world over are facing famine and hunger that they don’t need to be facing. Oh yeah, and this irony is just too much, the impact to our earth from a climate change standpoint, actually went UP. That’s what I want to avoid. I want to avoid further damaging economies, people and systems when we are not certain as to the fact, the cause, the extent or the possible impact. It may be that by taking too harsh of actions we actually do more damage than by doing nothing. GISS is Goddard Institute for Space Studies. This organization collects data and actually measures the surface temperature at its gathering sites. 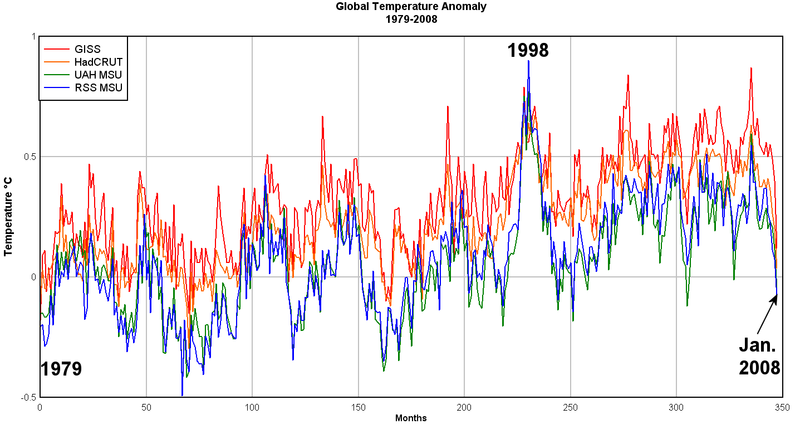 Lemme show you a graph that shows global temperatures displaying all 4 measures. So, is the world warming since 1979? Sure. Lots? Maybe not. Less than GISS might show? Almost certainly. Now, let’s see who runs GISS – James Hansen. Wanna see what he reported to Congress in 1988? Do you think that Mr. Hansen is motivated to demonstrate a higher and hotter trend than, say, someone who is not Mr. Hansen? I suspect so. “Few challenges facing America — and the world – are more urgent than combating climate change,” he says in the video. “The science is beyond dispute and the facts are clear. Sea levels are rising. Coastlines are shrinking. We’ve seen record drought, spreading famine, and storms that are growing stronger with each passing hurricane season. Climate change and our dependence on foreign oil, if left unaddressed, will continue to weaken our economy and threaten our national security. Lets take a look at the data. This comes to us from Ryan Maue from FSU where he is measuring the strength of hurricane seasons. So, not only are we NOT seeing stronger hurricane season, but we are seeing seasons as weak as we have seen in 28 years. Oh, the Sir Flaco-Sir Pino story; cute. Except that you have the premise backwards. Every single scientist believes that humans are contributing to cataclysmic climate change, only Sir Pino, played by Galileo, is saying that the world is round, not destined to be destroyed by humans. Turns out the temperature data for parts of Russia were contaminated. They used September data for the temperature in October. This past October is no longer the hottest on record. You would like to see the data on Arctic sea ice growing? Strange, I thought that somehow you subsisted on stories and bad bets. But here goes. Since October 2007, the amount of Arctic sea ice has grown by about 28%. 7,064,219 square kilometers now and only 5,487,656 square kilometers back then. Oh yeah, that Mars thing I spoke about? Data on Mars global warming can be found here, here and here. Think about it, what if the climate were actually not controlled by humans, but by the sun! How crazy THAT would be. Sir Galileo would turn over in his grave. But serious, if the sun is somehow cycling us through periods of slight, and I mean slight, temperature change, do you really think that any carbon emission reduction is either called for or plausibly impacting? So, to sum it up, all I am saying is that we should be careful in quickly coming to conclusions that require us to spend billions of dollars, jeopardize economies and potentially impact markets around the world. We should take a slower, more data driven approach to all of this and really consider what were up against. For example, what if the ice that was melting in the arctic was not melting because the air was warmer? What if it was melting because, in the summer when it doesn’t snow, black soot from China’s ever growing coal plants was falling on the snow? And when black particles land on snow—it melts. I don’t know if that really it or not, but what if it is? What if all we have to do is take the dirty coal plants in China and make them cleaner? No global warming, just global cleaner. Climate Change Must Include Global Warming? It would appear that I owe you an apology. One of my pet peeves is when, during a discussion, someone can not admit when they are wrong. My data is validated, be-atch. The APS is clear in that they continue to feel that their original claim was correct and is still correct. That we, humans, are causing climate change and that we must change. So, I am sorry. I was wrong. But, there is always a but, I am not convinced. As I understand it, you are claiming that people are causing the world to warm, and to warm to sucha degree that we will face dire circumstances should we not drastically change our ways. While I am not sure, I think that it is a basic tenant of the climate change camp that the globe is warming. Do you think that it is? So, in the last 30 years, do you see a trend that would show that the earth is warming? Looking at the above data, it would seem that not only are we not warming, we are cooling. In fact, the idea that we are cooling is something that is rather new and may explain why we have switched from Global Warming to Climate Change. Further, if we need physical evidence of the cooling affects that I suggest, there are reports that arctic ice is growing at record levels. Global Warming – Climate Change. Call it what you want, in the end, both fluctuate, both change over time and do so without human interference or help. My point is, I don’t see that we have definite proof that humans are causing catastrophic damage to the earth. 1. We (i.e. the people of the globe) are negatively impacting our environment. 2. Due to this… there is, and will continue to be, catastrophic consequences. Disagree. Though if you change “must” to “should”, then sure. We should not litter. You could make the same case if you fill the garage with water, or orange juice, or fire or cement or, well, kinda like anything. Reducing the carbon emissions in our world can’t be a bad thing. Look, thing thing that I am proposing, while perhaps not the catastrophic world killer that I make it out to be, it isn’t bad either. The Left is better at marketing their snake oil as “saving the world”. The right, well, we are just greedy bastards. You are right, reducing emissions isn’t a bad thing. However, the restrictions that are being called for ARE a bad thing. Or, at least in the form that they are being called for. You wanna not pollute? Me either, lets get a beer. You wanna say that we need $8 gas so that the public is motivated to demand alternative energy solutions? Yeah, ummm, no. In being concerned for people, we must be concerned for the environment. I am deeply concerned with the environment. And the damage that we do to it. I remember, as a kid, going to the creek or the lake and swimming, or fishing or canoeing…never concerned about what was in the water. Now, if my kids wanna do the same, I don’t think that I can afford them that same pleasure. And that makes me sad. We should take care of the earth that we have been given. I consider myself extremely spiritual. I find those moments of Grace as often in the church as I do in the misty morning fog covering the lowlands of the river basin near where I live. Driving to work with the kids, I take time to turn down the radio and point out the marvelous Majesty of the Creator. They are in awe and wonder. That they may not have the same simple pleasures….well, it is unthinkable. I like having my highways clean, my rivers clear and my oceans the deepest blue. I want Bald Eagles to fly and live and flourish in their natural habitats. I want and demand all of that. In fact, in that, in that silent moment as the water cascades past the rubble of rock and the crayfish scuttles into his cave, it is that moment when we are at one with Creation. I get it. That does not, however, mean that that what we are doing, in totality, is destroying that. I was in Disney this past few days and say the Lion King Circle of Life show on the environment. While we were waiting to get into the theater, they had information on the monitors, kinda flashing by. Did you know that cars today emit 95% less pollution than they did in the 70’s? but this is the same as driving my 1966 mustang into a wall. Walk the walk baby, drive that Mustang of yours into the wall and contribute to a better tomorrow for my kids. Unless, of course, you are really more interested in changing how I live than how YOU live..